When you sign up for our SEO services you will received a monthly report that will show your Rankings and Analytics data. 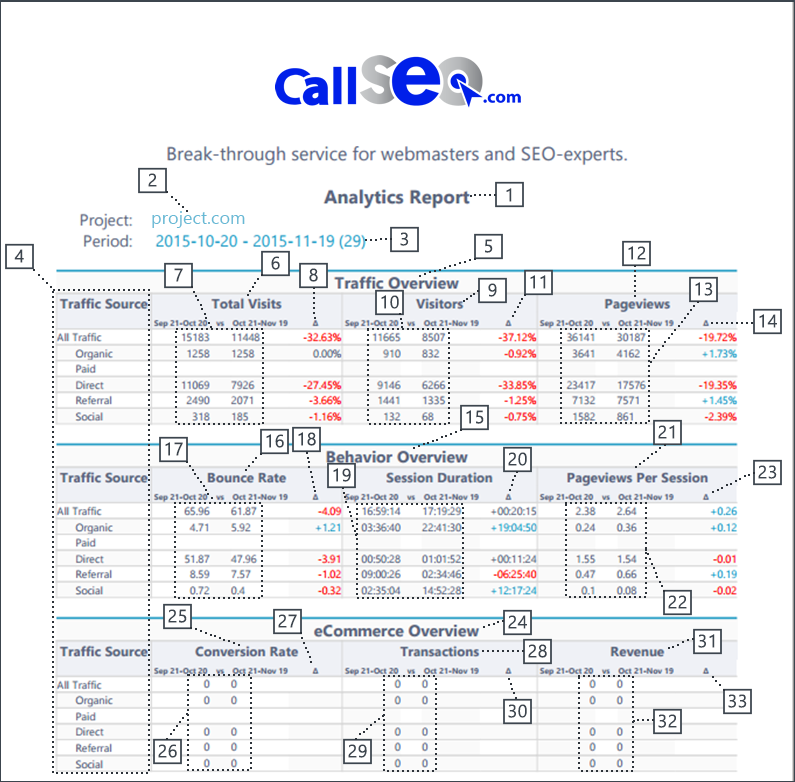 Below you will find a details on how to read your SEO reports. Ranking section shows the information separately for every search engine added to a project. The green arrow shows how many keywords went up(position in SERPs) and the red one – how many keywords went down. Delta displays the number of keywords that reached Top-10(green color) or fell out(red color). Simply, it is the difference between two dates that are compared. Traffic section represents the information of all visits, unique visitors and organic traffic(a week data is compared with another week). Dynamics is the difference between the compared periods. Conversions section obviously shows the number of conversions for specific period and dynamics displays the difference between the compared periods. Two dates that are compared with each other. These dates refer to “Ranking” data table. The name of project for which the report is received. The number of keywords, which have risen in the ranking (quantity). The number of keywords, which have fallen in the ranking (quantity). The difference between risen and fallen keywords (quantity). The search engines that were selected for current project. Two periods that are compared. The difference between two compared periods. 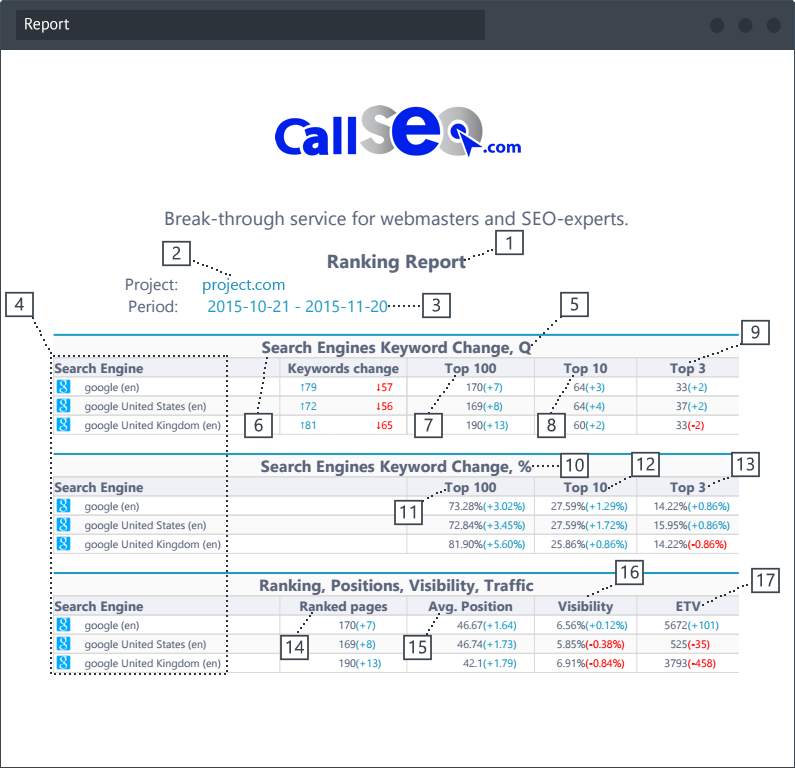 The report shows Ranking details for each search engine that was added to a project, understandable chart and information about every keyword of current project. Two dates that are compared with each other. Quantitative value of keyword position changes. Common keyword position changes (blue color – risen keywords, red – fallen keywords). The number of keywords that are in TOP100 (in parentheses indicate how many keywords rose/fell in the TOP100. The number of keywords that are in TOP10 (in parentheses indicate how many keywords rose/fell in the TOP10. The number of keywords that are in TOP3 (in parentheses indicate how many keywords rose/fell in the TOP3. Percentage value of keyword position changes. The percentage of keywords that are in TOP100 (in parentheses indicate how many keywords rose/fell in the TOP100. The percentage of keywords that are in TOP10 (in parentheses indicate how many keywords rose/fell in the TOP10. The percentage of keywords that are in TOP3 (in parentheses indicate how many keywords rose/fell in the TOP3. The number of unique and relevant pages. The average position of a website. Visibility value of a website. Estimated traffic value of a website. And now let’s take a look at report(Analytics) in PDF format. 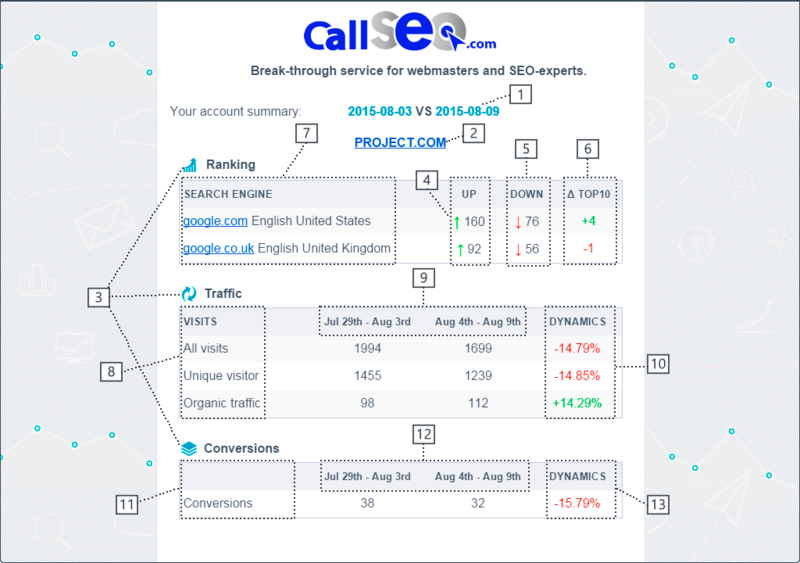 Key Analytics data and convenient chart for TOP landing pages are displayed in the report. Traffic overview for current website. Number of total visits for compared period. The difference between the compared periods. The information about the number of visitors. Number of visitors for compared period. The information about the number of pageviews. Number of pageviews for compared period. Behaviour overview for current website. The information about Bounce rate. Percentage value for compared period. The difference between the compared periods (percentage value). The time of session duration for compared period. The information about pageviews per session. Pageviews per session for compared period. eCommerce overview for current website. The information about conversion rate (percentage value). Value of conversion rate for compared period. The information about transactions (quantitative value). The number of transactions for compared period. The information about revenue (currency specified in profile settings). Revenue data for compared period. 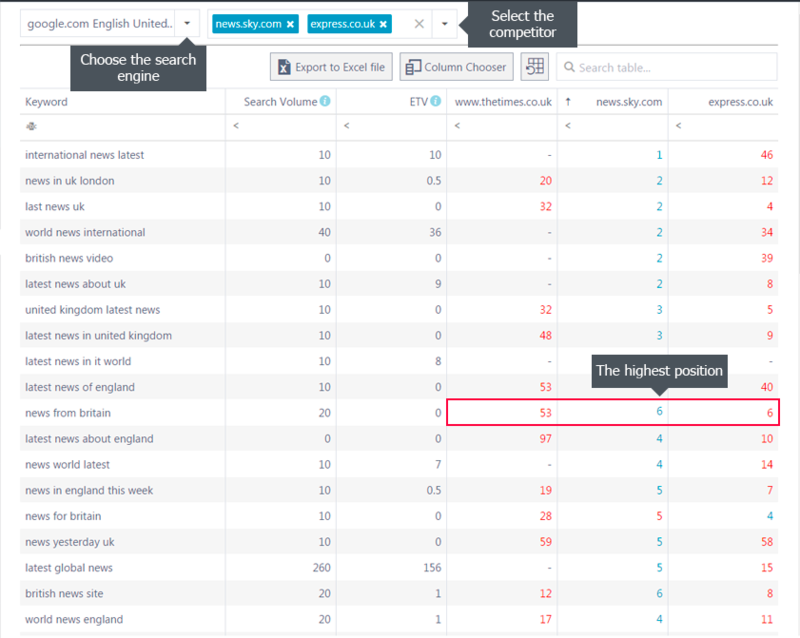 Search Volume, Estimated Traffic Value (ETV) and the ranking position for each keyword that you have in a project. Plus, if RankActive database already has keywords that your competitors use, they will also be added to the table for comparison. You can select the desired competitor(s) and compare the data. The value of blue color helps you to define the highest position among the displayed ones instantly. The information is shown for the chosen search engine.